One of the most interesting things about running my business Credo has been watching the pros on the platform sell their services to businesses interested in hiring a digital marketing professional. I have experience working in sales so as I have watched agencies and consultants try to sell their services, I’ve been able to guide many of them to much better close rates and therefore a lot more revenue for their business. The quantity and quality of the leads have gone up as the year had progressed and you are now one of our highest converting sources for leads. This was an agency that had not closed the first 8 leads that Credo sent to him, but through some coaching on my end they have now closed the last 4 and have 2-3 more deep in the sales funnel. Here are some of the lessons I have learned watching agencies sell consulting contracts. I’ve also pitched to speak on this topic at a few conferences, so hopefully you’ll see me onstage somewhere! There’s a saying that “the early bird gets the worm.” I cannot stress how unbelievably important this is in sales. When you receive a new lead, you should respond to it in under two hours max (unless it’s received on the weekend or very late at night). When a business submits an inquiry to more than one pro on Credo, 90% of the time the business who responds first wins the contract. Very rarely are small to medium businesses (SMBs) doing research and getting multiple proposals over time to figure out if they should start work in a few months. Instead, they are often looking to get started as soon as possible, and most of the time they want to get started yesterday. Small businesses operate on monthly, not quarterly, budgets. They want to move quickly and see if something works for them, then continue if it does and cut it out if it does not. SMBs operate like startups in this way. So responding quickly and keeping their attention is paramount. Repeat after me: never ever ever respond to an inquiry and ask for their “thoughts or concerns” about you/your agency/their project. This kills their trust in you and therefore they often will not respond to your email because you are already asking them to do mental work, and most people are allergic to mental work. I always advise pros to follow up with a quick message and then offer to hop on the phone as the next step. You get bonus points if you can link them to a Calendly calendar so they can schedule a meeting according to their schedule. Learn their budget, ability to get things done, and timeline. All you need realistically is 15 minutes on the phone with them and your proposals will become more targeted towards your potential client’s real needs. Every person inquiring about your services is talking with multiple service providers. That’s just the reality of the beast. So you need to figure out how you set yourself apart and give yourself the best opportunity to win the potential client’s business. You need to prove to them that you can get them the results they desire, should you decide that you want to try to win the business. The preliminary phone call should accomplish this, and now your challenge is to give yourself the best chance to win the business. These four help you figure out how quickly you need to get the client your proposal. By setting their expectations, they are not left wondering if they can meet their deadlines for choosing someone, and by delivering on time (or early) you prove that you are reliable and trustworthy. They want to be pitched and want to get work as cheap as possible. As an agency owner or freelancer however, knowing their budget helps you craft better proposals and not pitch them a project that is astronomically more expensive than they could afford. If I said this project would be $10,000 per month for 6 months, what would you say to that number? Their answer will tell you a lot about where they are in their decision process and where you need to make them feel comfortable. After you send through your proposal, the next step should always be having another discussion on the phone to talk through the project and help them understand all of the parts you proposed, as well as why each of those parts is necessary. Not following up on the phone is the second biggest mistake I see agencies make, only second to not getting on the phone in the first place. This second phone call allows you to continue building the relationship and setting their concerns at ease. Hiring a good marketer is not cheap, so you need to make them feel comfortable that you can deliver the results they need for the money that they are spending with you. The phone is hands down the best way to do this. You’re competing against at least a few other agencies or consultants in every pitch, and the reality is that some of them are probably better at what you do than you are. Assuming you can actually do the work and deliver the results that they need, you now need to set yourself apart from your competition. The reality of selling consulting arrangements is that the sales process can sometimes be quite lengthy. Therefore, you must make sure you stay top of mind in a helpful way. My strategy for following up and being helpful is to avoid appearing desperate or like you are working too hard for their business. Using Google Inbox, I set emails to come back to me in a week so I can be sure to follow up if they have not responded. Sometimes in those emails I will also send them useful information I’ve come across recently that they might also find useful as they think about their project. Remember, you’re earning their business not trying to trick them into paying you money. 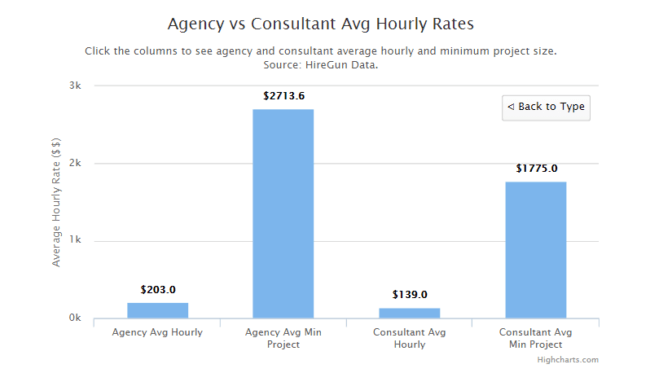 As stated above, the sales process for consulting and services projects can become quite lengthy. Businesses tend to take quite a long time to make decisions on large expenditures, so earning their businesses as stated above can be a long process. Let me encourage you to not give up. I cannot tell you the number of times that I have or have seen agencies pitch a client only to have the client go dark and never respond or hire inhouse, but then come back a few months later wanting to kick off the project as soon as possible. I’ve personally had this happen 3 times in the last 6 months, off a total of maybe 8 proposals I’ve actually sent out, and I see it happen all the time with Credo agencies. No business takes off instantaneously. That’s a fallacy that publications like to espouse, the myth of the “hockey stick viral overnight success”, because it drives pageviews (they are businesses too, remember). Businesses grow step by step, client by client, month by month. As you sell work, try to concentrate on the clients that you think will stay with you for a long time. By signing clients who want to have a long term working relationship to build their business for the long haul, you’ll build a sustainable business. The agencies I see struggling are not the ones pitching all the leads they get or could pitch. Instead, the agencies I see winning are the ones who are focusing down on what they are really good at and can get outsized results for time and time again. The reality is that most of these fears are just in your head. We always put off the things that we are most scared of, but those who get ahead face their fears head on. Raising your prices is the easiest way to provide more value to your clients simply because you need fewer clients at a higher price point to make ends meet, and thus you can provide better results to your clients, which will keep them around longer and allow you to spend less time on business development overall. A must read on raising prices: Patrick McKenzie on growing a consulting business. If you’re a consultant or agency owner, what are the things you’re struggling with regarding sales? And if you’ve been in it for a while, what advice would you give someone just starting out?